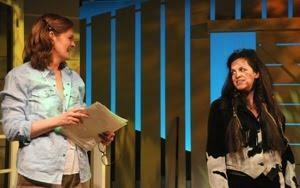 Emily DeVoti’s provocative two-act play, MILK, opens in a spare farmhouse kitchen. It’s 1984. Ronald Reagan has just been elected US president and local newscasters seem to have nothing good to report. Meg (played by Jordan Baker), a former mathematician who loves precision and order, and her husband Ben (Jon Krupp), a former investigative reporter, are sitting at the table and talking, but it’s the kind of tense conversation that can quickly turn from controlled anger to fierce argument. Things are bad, very bad. A drought has made dairy production virtually impossible, and land that’s been in Meg’s family for centuries is now on the cusp of foreclosure. On top of this, their college-aged daughter—who is never seen but is referenced at key moments in the play—wants to be an actress and their fourteen-year-old son Matt (Noah Robbins) wants material things his parents cannot possibly afford: name-brand sneakers, CDs, a bedside color TV, and stylish clothes, among them. Worse, there’s a city slicker on the prowl, and he’s made no bones about wanting to “help” Meg and Ben ease their financial woes. Ben thinks it’s good idea, "a gift from God"; Meg doesn’t. By the time businessman James (Peter Bradbury) and his teenaged daughter, Veronica (Anna Kull), arrive on the scene—in a private plane, no less—things have deteriorated even further. But James couldn't care less about the family’s personal difficulties. Instead, he’s turning his managerial acumen to improving the farm’s productivity. Although he knows nothing about cows, he hatches a plan that, on paper, will foster unprecedented growth and save the day: importing “wild, hairy, horned” bulls to impregnate the many heifers dotting the pastoral landscape. As you have probably guessed, things don’t pan out as James—or Ben or a reluctant Meg—expect. While the second act of the play is far weaker than the first, the excellent cast, including Caroline Baeumler as Auroch, a talking bovine the Program Notes describe as “quite possibly the last living wild cow,” briefly explore a number of evocative themes including monetary pressures; urban versus rural lifestyles; marital fidelity; self-sacrifice; coming of age; and the festering ache that often accompanies keeping silent about things that matter. In fact, by the time Veronica tearfully confides her father’s secrets to Matt, the pathos is so intense that James instantly morphs into someone less repugnant. In the end, while we may revile Matt politically, DeVoti renders him a multidimensional personality who is deserving of compassion. There are no easy answers in MILK. Indeed, as the world changes, some customs and practices inevitably become obsolete and are replaced by newer rituals and activities. The key is figuring out which pieces of cultural and personal history to retain and which to let go. At one point, Meg looks into a bucket of unpasteurized milk and declares that “the pure stuff, it corrupts so easily.” Maybe so. MILK asks its viewers to think about what’s negotiable and what isn’t. Regardless of what is ultimately decided, one thing is certain: after watching this well-executed play, urban audiences will think about cows in a whole new way.